The Indian cosmetics industry is continuously witnessing firm growth over the past years. As per Goldstein Research, India cosmetics market is valued at nearly USD 11.16 billion in 2017 and is anticipated to grow at a CAGR of 5.91% during the forecast period 2017-2025. Furthermore, it is estimated annual retail sale of cosmetics & other personal care products is growing in the range of 15-20% annually, thus placing the domestic demand in India as one of the fastest growing across the world. Over the past 5 years total demand has grew by 60%. India cosmetics industry is driven by the high personal disposable income of people, rising awareness towards body aesthetics, coupled with increasing demand for herbal cosmetic products. High adoption of herbal products has led to growth of the segment at 15% annually, on the back of the fact that people are becoming more aware of possible side effects on skin by constantly use of chemical formulations based cosmetics. In terms of product type segmentation, skin care products such as anti-wrinkle creams, toners, cleansers, facial creams, etc. account for largest market share, and an important component of the market. The whitening creams market holds entirely unique status in the Indian subcontinent & has witnessed highest growth rates in past years. 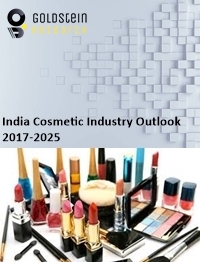 Our India Cosmetics market report comprises of the following companies as the key players: Himalaya, Biotique, Dabur, Lotus, Patanjali, Coach, LVMH, Puig, Shiseido, the Estée Lauder Companies Inc., Ralph Lauren Corporation, L’Oréal, Coty, Revlon, Avon Products, Inc., Hermès, Oriflame, The Procter & Gamble Company, Unilever PLC, GIVI Holding S.p.A., Christian Louboutin S.A., Bottega Veneta, Balmain, Azzaro, Carolina Herrera, Groupe Clarins SA, etc.